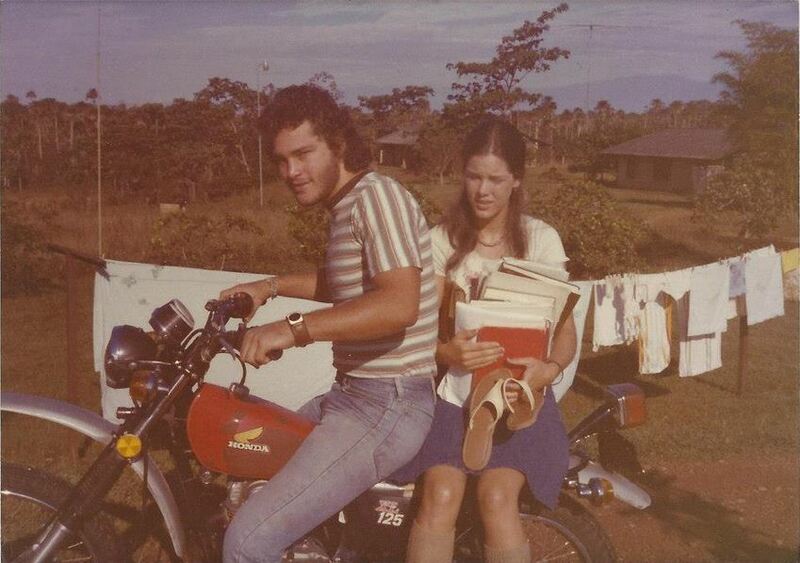 Doug and Virginia going to school, Loma Linda, Colombia, n. d.
[Virginia, showing photograph]: My brother—he was two years older than me—he was killed in a motorcycle accident down in Colombia [December 21, 1983], so this is a memorial of him. He was very good on a motorcycle and also a daredevil, as was . . . as is my sister. So you have a son named Douglas. This is my brother Douglas and I named my son Douglas after my brother. [T. J. ]: And my Douglas was a daredevil, also. [Virginia]: Oh is that right? This was a memorial motorcycle trip down to Peru [sic]. They went over the Andes. Well, anyway, they had a memorial for my brother up in the Andes Mountains. They built a rock memorial and so they were dedicating it. [Kathy? ]: There’s Bruce [Lee’s son] at the memorial. [Virginia]: Yeah. That was up in the Andes Mountains in Peru. [Steve]: That’s Dougie [shows another photograph]. [Steve]: Yup. I think I might have taken that picture. Anyone else in the family—past or present—named Douglas? Which Kindberg sister is the daredevil on the motorcycle? Virginia, can you guess at a date for the photo? I know it’s tough to relive, but if anyone wants to tell about the accident in more detail, we’ll listen. Bruce, do you want to tell about the memorial trip? Was the memorial trip indeed taken in July of 2010 as I’ve noted on the photo? Who all went? From where to where? How long did it take? What else would you like tell us about it? Family, do recall hearing about Doug’s death? Can you tell us about your experience? Steve, can you point us to the photo you were thinking about toward the end of this piece? This entry was posted in Lee and tagged 1983, Colombia, Doug Gorman, Doug Kindberg, Douglas Ramey, Peru, Virginia Gorman on April 22, 2015 by Dawn Duncan Harrell. I believe the photo of Doug and me on the motorcycle would be his Sr year of HS, ’78-’79. I could not guess any closer to the date than that. Kathy is the sister who is the daredevil. You can view a picture of Kathy in the Album on my FB page, named “In memory of Douglas Mark Kindberg”. Kathy, Doug and another deceased MK, are looking over a cliff, contemplating a jump. You would have to ask Kathy how high the cliff was. If my memory serves me right, Kathy DID jump off. I believe at the time, in the group of young adults there, she was the only girl to jump. 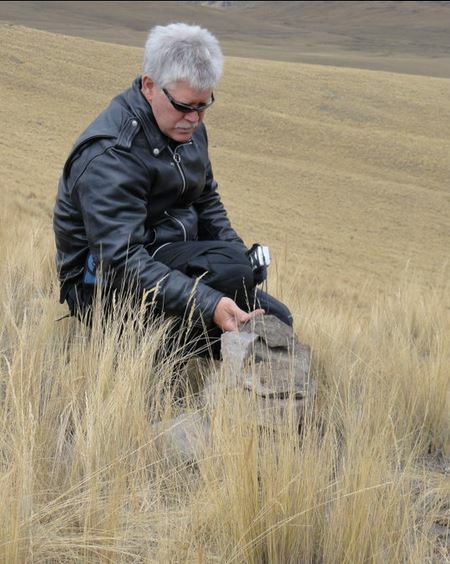 Bruce was on a motorcycle trip with other Peru MKs (missionary kids) and others. There is a MK who was in Kathy’s graduating class from Peru, who currently is a missionary in Peru, who organizes motorcycle tours of Peru. The year Bruce went, they encouraged the Kindberg kids to go as they were dedicating that trip in memory of Doug, thus the memorial that was set up in his honor, the picture you posted. Unfortunately, Bruce was the only one that was able to go. Doug’s death: The night he arrived in Lomalinda, Colombia, the Wycliffe center in the middle of the Colombian plains, he was with some of the younger missionary kids, having fun pulling “wheelies” on his motorcycle. At the insistence of our mother, he had just tape recorded his trip from Dallas, down through Central America, with his destination being Lomalinda, where our parents were serving as missionaries at the time. It was about 10:30 PM, very dark, on a dirt road he was very familiar with. He unfortunately, hit a ditch, sustaining head trauma. There was not hospital to go to. No doctors there. There was only a nurse. My mom and dad performed CPR on him until daylight and then he and they were began the trip to Bogota, the capital of Colombia, to seek medical help. However, just minutes into the flight, Doug died and so they returned to Colombia. I believe he was buried within 24hrs. Gail, Bruce, Brenda (Bruce’s 1st wife) and I flew down to Colombia as soon as we were able to. Kathy went later when she was able to. For some reason Eric was not able to go. A picture of Doug is also in the FB album mentioned above. Gail and I were living in a dorm at the church where we were going to Bible school. We had gotten the news of Doug’s arrival the night before his death, after praying and worrying him through his adventurous trip. So we were devastated when our dad called and told us the news of his death. Thank you for all your work in writing up these stories!! I enjoy every one of them! !